With locations across Chicago and in Evanston, the Chicago Athletic Clubs is the most convenient health club to bring your sports training to the next level. Whether it’s marathon training, swim competitions or just staying on top of your game, there is simply no better training destination for athletes! Chicago Athletic Clubs is home to professional weekend warriors and entire sports teams alike. From our Triathlon Club to Masters Swim Team to our Weekend Workout Forums, we offer you a community in which to achieve and perform at your very best. And our Certified Personal Trainers will offer the perfect sports-specific training regimen for anyone looking to enhance their performance in any sport. With all that and our state of the art facilities with top of the line equipment and cardio machines, we have everything you need to improve your sports performance and take home the gold. Want to reboot your energy? It starts from the inside out. 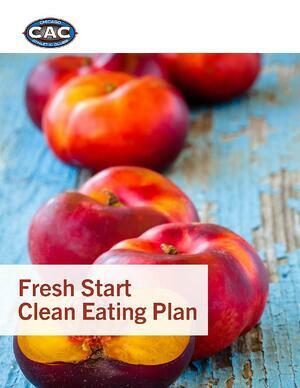 Get the basics from our Fresh Start Clean Eating Guide. This Ebook has everything you need to easily understand the principles of clean eating and apply them in a no hassle way. So you can start eating clean, for a healthier, more energized you!